Building on this argument, unions have recently brought several court cases challenging right-to-work. Having to represent workers who don’t pay them, they say, is a violation of constitutional takings clauses. Depending on the makeup of the U.S. Supreme Court, unions could use this argument to overturn seven decades of precedent, killing right-to-work for the entire nation. Worker’s Choice would end the issue of free or forced riders. * Worker’s Choice would let workers who opt out of a union in a right-to-work state represent themselves before employers. It would also free unions from having to represent nonpaying workers. With Worker’s Choice, each worker can stay in the union that is in the workplace. Alternately, they can negotiate for salary, benefits and working conditions independently. With Worker’s Choice, unions are freed from having to represent workers who are not paying them and workers are freed from accepting forced union representation. One-or-none — Worker’s Choice does not change collective bargaining for unionized workers in any way. If there’s a union presence in a workplace, it’s one union that will still represent all the unionized employees there. The one-or-none provision safeguards against having multiple unions at a worksite. It imposes no new duty to bargain on employers — Workers who wish to exercise Worker’s Choice are treated as nonunion and the employer is under no duty to negotiate with them, mirroring the job creators who employ over 87 percent of nonunion workers in the rest of the economy. An employer may, if he or she wishes, negotiate individually with these employees as a way to attract and retain top talent. Unions cannot affect individual contracts — Worker’s Choice prevents unions from basing their contract off the independent employees’ contracts. For example, unions cannot say that the highest paid independent employee must be paid lower than the lowest paid union employee. 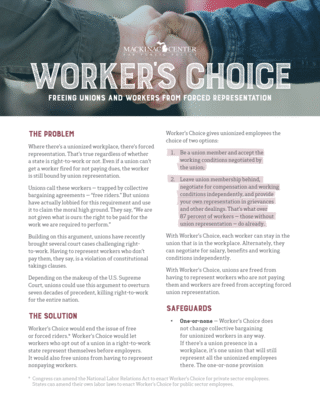 Addresses the main union objection to right-to-work: Worker’s Choice eliminates the free/forced rider issue, one of union’s most powerful objections to right-to-work. Protects legal challenges to right-to-work: Worker’s Choice would negate the main legal argument for overturning right-to-work, the argument of violating the takings clause. Rewards employee productivity: Under Worker’s Choice, employers can reward higher performing employees without being limited to a collective bargaining agreement. Advances personal flexibility: Worker’s Choice lets workers represent themselves and negotiate their own contracts, which are driven by personal needs rather than collective ones. Makes unions more responsive: Worker’s Choice will require unions to be more responsive to the needs of their members or risk losing them. Provides the above benefits to employers without imposing new obligations: Worker’s Choice does not create any new burdens on employers; its one-or-none provision safeguards against multiple unions. The employer does not have any more increased obligation to employees exercising Worker’s Choice than employers in a nonunionized worksite, i.e. no duty to bargain. * Congress can amend the National Labor Relations Act to enact Worker’s Choice for private sector employees. States can amend their own labor laws to enact Worker’s Choice for public sector employees.